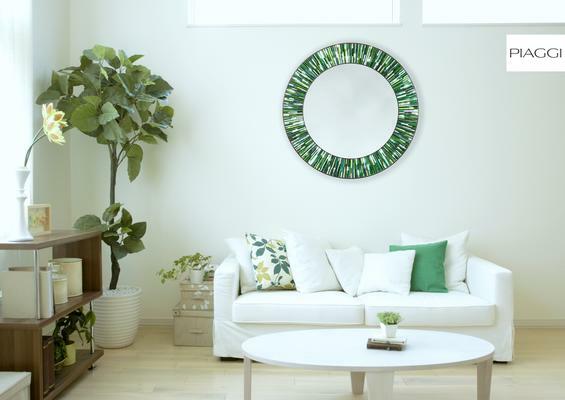 Stunning handmade round mirror using mosaic green glass colour strips and mirror pieces arranged in elegant colour variations. Sizes: 80 cm, 100 cm, and 120 cm. Light wood, dark wood or white frame. 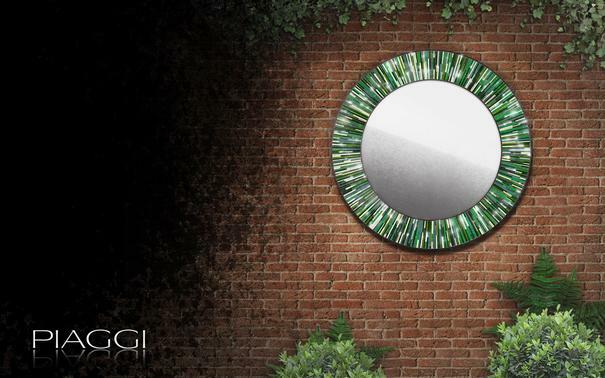 PIAGGI hand-made mirrors are manufactured with precision and passion; they are also very impressive, designed for all the people looking for something unusual and unique. 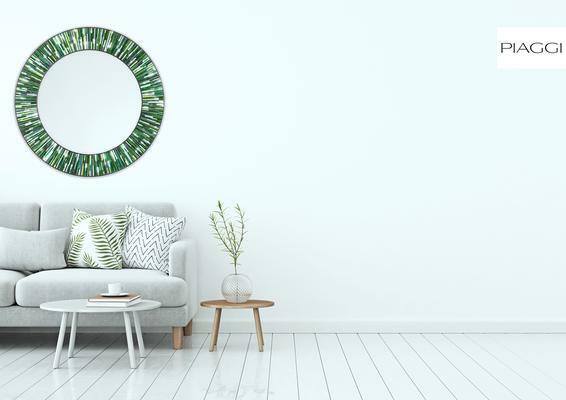 Hand-made decorative mirrors usually give you more possibilities to ideally match the mirror to your interior. 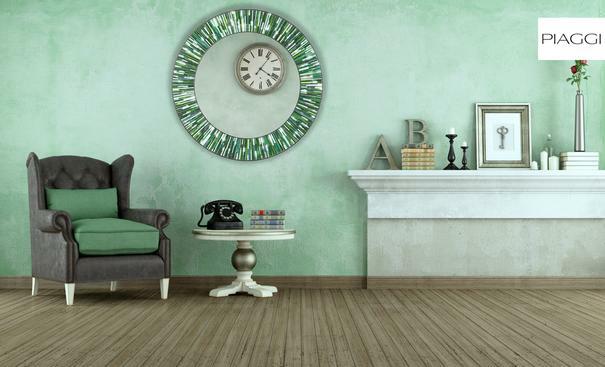 Try to find the frame which enriches your space best. 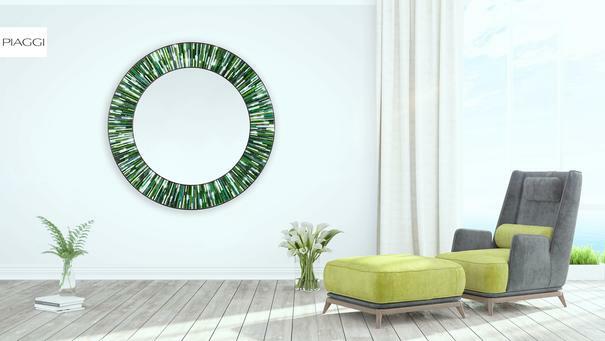 A contemporary mirror is not only a functional home accessory, but also a piece of decorative contemporary art and it is very important to choose something you simply find beautiful. 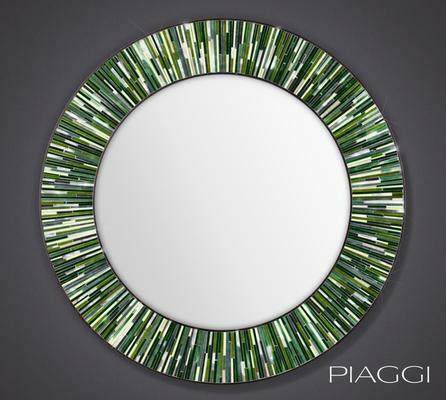 All PIAGGI products are made to order, so they are unique and manufacturing time may range from three to four weeks. However, timescales or dates indicated for delivery are for guidance only, and can change, especially when bigger orders are placed. To avoid damages during transportation, Piaggi mirrors are delivered using dedicated mirror delivery company Fragilistics covering every postcode in mainland UK and delivering weekly. They ensure best service and up to an hour notice of the delivery to avoid waiting in all day. Smaller products are delivered by leading parcel delivery brand DPD which provides parcel recipients with tracking and a one hour delivery window, notified by SMS and email. Bigger products sent to countries other than UK are delivered by DB Schenker Logistics, a leader in supply chain management and logistics solutions. Inspect for damage upon delivery. Any claim received later and not confirmed by the protocol of damage will not be considered. This item is sold and dispatched directly by Piaggi. 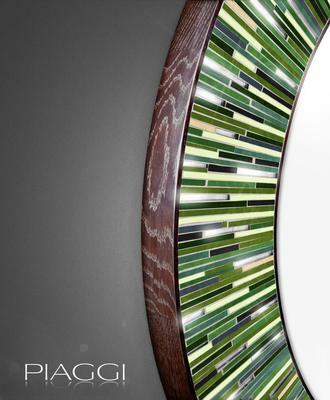 PIAGGI is a European creator of luxury home interiors items such as glass art panels, mosaic mirrors and other unique furniture. 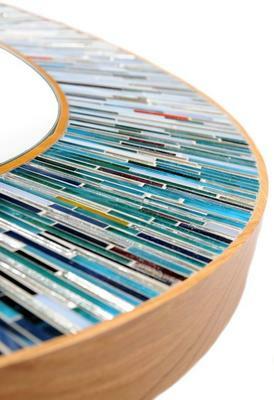 Piaggi's designers achieve stunning abstract imagery and create elegant and majestic art pieces by using colour in a unique way. Their designs use clever eco-friendly materials such as timber and art glass to form modern intricate shapes perfectly fitting every type of interior.